The Armchair Mayor’s writing certificate from 1956, signed by H.B. MacLean himself. The name is spelled wrong but the handwriting is nice. Yes, you reply, that’s obvious. No, I mean that literally: I can no longer write longhand. I lost the ability years ago, probably around the time I lost my last comb, or my Blockbuster Video card. On those rare occasions when I am forced to abandon my keyboard or my phone and pick up a pen instead (what am I, Amish? ), I print the letters individually, not cursively. Even then the results come out in a chimp-fisted font best described as Early Ransom Note. This is neither rare nor new. For many of us, longhand gave way to digital decades ago. As far back as 1999, letter-writing — at least of the envelope-and-stamp variety — had declined so sharply that Canada Post launched an advertising campaign encouraging us to put pen to paper more often. Yes, comes the reply today, that’s why we stopped writing them. Why labour when you can just text two happy faces and a beer mug emoji? So, imagine my surprise when an envelope containing a five-page, single-spaced, handwritten letter landed on my desk. “What are these squiggles?” asked the young colleague who opened it (she had done so at my request, as I had automatically assumed the envelope contained anthrax spores). OK, that’s an exaggeration. They still teach both printing and longhand in B.C. schools, though it’s no longer required that students conform to a standard style of penmanship. That frees them from the tyranny of the MacLean Method of Handwriting, a regimented style drilled into students across much of Canada for generations. The MacLean Method was developed right here in Victoria in 1921 by H.B MacLean, the first principal of George Jay Elementary, in response to teachers’ complaints of sloppy handwriting by students. MacLean’s method was so widely accepted (at its peak, it was used by schools in seven provinces) that when MacLean died in 1976, the Vancouver Sun marked his passing with an editorial published entirely in longhand. It was ingrained. No more. Even if B.C. kids learn handwriting today, it’s in the way their parents learned Grade 8 French: If you’re not using it outside the classroom, how deeply will it take root? A vigorous rear-guard action is still being fought, mind. The Saanich Fall Fair has a penmanship competition for young people. The fair’s Diane Taylor, a former teacher who once judged the category, speaks glowingly of the elegance and character imparted through cursive writing. More important, perhaps, is what it means to the thought process. Most of what we get by email or text isn’t writing, it’s typing — unfiltered blather that pours out as fast as the fingers (or, now that we have voice-to-text, the tongue) can move. Back in the olden days, the cumbersome nature of handwriting, the lack of a backspace key, forced people to take the time to really work out what they wanted to say before committing words to paper. Composition required care. (“I only made this letter longer because I had not the leisure to make it shorter,” French mathematician and philosopher Blaise Pascal wrote in 1657.) Back in the olden days, you could tell how long a writer had slaved over a letter because it came out of the envelope smelling like half a pack of Export A’s. Not now. Now, emboldened by the self-righteous certainty of the terminally ignorant, we post opinions — judgments, really — faster than we can digest the information needed to inform them. Maybe that would have happened in times of yore, too — give ol’ Blaise Wi-Fi and an iPad, he might have churned out 3 a.m. drunk-tweets about Stormy Daniels and a wall with Mexico — but we’re not leaving a great legacy today. That’s what was impressive about the letter in the mail Friday. It was well thought out, logical, linear. It had obviously taken effort to write. It was a pleasure to receive — which is why I replied with two happy faces and a beer mug emoji. 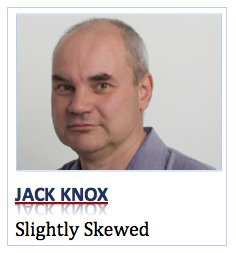 Jack Knox is a born-and-raised Kamloops lad who once worked at the Kamloops Daily News. He is now a columnist with the Victoria Times Colonist. Since joining the Times Colonist in 1988, Jack has worked as a copy editor, city editor, editorial writer and editorial page editor. Prior to that he was an editor and reporter at newspapers in Campbell River, Regina and Kamloops. He won the Jack Webster Foundation’s City Mike Award for Commentator of the Year in 2015. Funny, sad and oh so true, Jack. Good work. I got into a dust-up with two of my nieces a few days ago and thought about sending them a lovely hand-written card saying something like “doesn’t love, forgiveness and diversity keep the world going round?” But I don’t know their postal codes. Not entirely sure they do either. Great note above Nancy. I hear what you are so intelligently saying. “The medium is the message.” And the medium keeps changing … If we could go back in time when nieces had postal codes and my cursive writing skills were more practiced, I’d send them hand-written cards. Unfortunately, I will have to contact them thru one social media form or another and they are way better at this than me. And I agree. If they don’t learn cursive writing skills anymore, could they at least learn something about spelling and grammar? Dear Mr. Knox: Learning and using cursive writing instills a discipline of thought that can be carried through to the keyboard. Unfortunately, as you point out, if we start from the keyboard, there is no discipline to our communications. Emojis and stickers replace ordered thoughts and well-considered phrasing. Marshall McLuhan believed that “the medium is the message,” Computers, iPads and cell phones are tools intended to be used to communicate our thoughts to others. However, they have indeed become the “message” and their ascendance over the written word is a sad commentary on human evolution. The inability to spell accurately or use proper grammar and the five-second response time to texts and messages tends to portray the writer as lacking in intelligence and incapable of presenting a well-reasoned argument. Unfortunately, more and more, this is becoming an accurate portrayal.